A graphic novel biography of the American legend who inspired the hit Broadway musical Hamilton. Alexander Hamilton was one of the most influential figures in United States history--he fought in the Revolutionary War, helped develop the Constitution, and as the first Secretary of the Treasury established landmark economic policy that we still use today. Cut down by a bullet from political rival Aaron Burr, Hamilton has since been immortalized alongside other Founding Fathers such as George Washington and Thomas Jefferson--his likeness even appears on the ten-dollar bill. 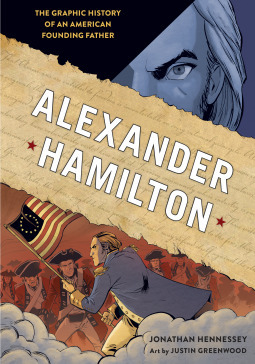 In this fully-illustrated and impeccably researched graphic novel-style history, author Jonathan Hennessey and comic book illustrator Justin Greenwood bring Alexander Hamilton's world to life, telling the story of this improbable hero who helped shape the United States of America. As some of you might know, I used to do quite a few comic book reviews. Sadly, I don't have as much time these days so I leave most of that to my staff over on Geek-o-Rama. Still, when I get the chance, I still reach out and grab it! This book was the perfect for that kind of thing. It has three of my favorite things: comics, history, and a great "story". Let's break this one down in one of my favorite ways: The Good, The Bad, and The Summary. This book is full of information! It may be a biography of Hamilton, but it also covers a lot of what was happening during that time, not just here but in other countries that would get involved. The dialogue included quotes from actual letters and pamphlets of that time period. That's some serious dedication to the project and I love to see that kind of effort put into a project. While I generally enjoyed the art, it was sometimes tough to keep track of who was who. After all, there were a lot of white men wearing white wigs! The only other thing is that the language in this books makes it more suitable to an upper level high school student versus anyone younger. All in all, if you like history, have an interest in Hamilton (the musical), love graphic novels, or a combination of any of the above, go ahead and check out this book. I think it's going to be a really good addition to my books on history shelf.